VZ Transfer is an app for Verizon iPhone users that helps you with transferring your contact information to your brand new Verzion iPhone. Logically, this app only works on the Verizon iPhone so I have not been able to test it out. The app is developed by the Verizon Wireless IT support team so it is in fact an official application, that you can trust installing on your Verizon iPhone. 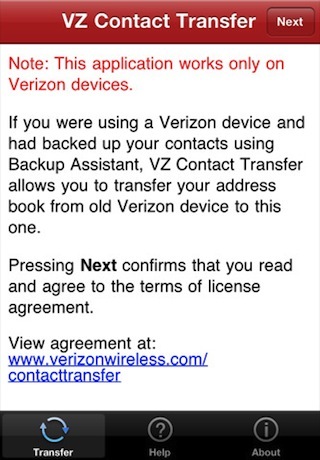 If you used the Backup Assistant from Verizon on your previous phone, the VZ Contact Transfer app will import your address book from your old Verizon phone to your iPhone. Perss the Next button to get started. Then you will enter your phone number and the app verifies your account and sends you an SMS text message with a secret 8 digit Access Code that you enter into the VZ Transfer app, and press OK. The app then connects to the Verizon servers and your Backup Assistant contacts get imported into your new iPhone, plus any of your new manually entered iPhone contacts also get synced back to the Verizon servers. You will see a message telling you how many total contacts were imported. Note: If you want to use the program called Backup Assistant to transfer your contacts instead, you will have to do it using iTunes, which is a more complicated process. The VZ Transfer app is free and a great service from Verizon to help welcome its new iPhone customers. 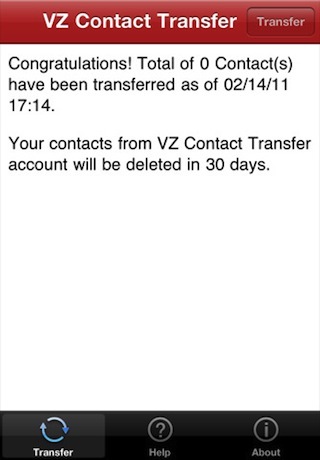 AppSafari review of VZ Transfer was written by Joe Seifi on February 7th, 2011 and categorized under App Store, Contacts, Free, Phone, Utilities. Page viewed 4813 times, 2 so far today. Need help on using these apps? Please read the Help Page.